Sarens has been using a Demag CC 8800-1 lattice boom crawler crane to lift heavy equipment for the construction of India’s Ramagundam Fertilizer Plant. The project involves the construction of a new ammonia plant and a new urea plant with capacities of 2,200t per day and 3,850t per day, respectively, as well as developing an ancillary offsite and utility facilities. Once completed the plant will produce 1.12 million tonnes of urea annually. When the Sarens team began reviewing the project, they quickly determined it would take a large crane, like the company's 1,600t capacity Demag CC 8800-1 crawler crane, to complete the job. To aid with assembling the CC 8800-1 and act as a tailing crane, Sarens also deployed a Demag CC 2800-1 lattice boom crawler crane. 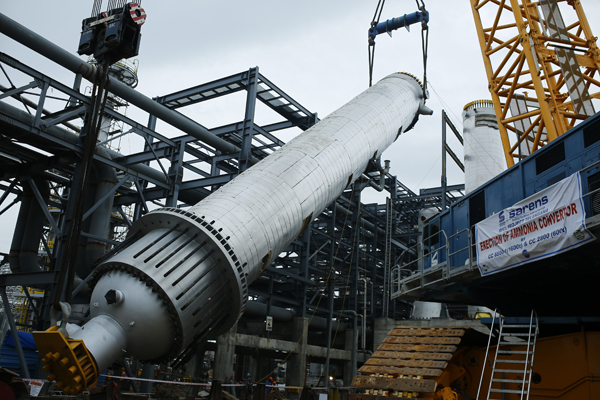 For the first, and one of the most challenging lifts, Sarens needed to lift a 425t urea reactor into place. The reactor measured 53m in length and 3.8m in diameter. 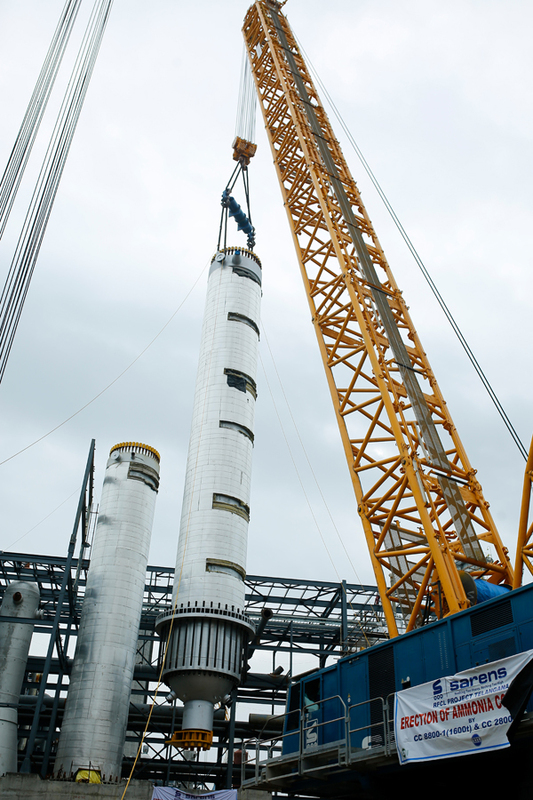 To perform the lift, the reactor was upended with the CC 8800-1 crane in an SSL 84/72 configuration at a lift radius of 24m. The CC 2800-1 assist crane was used in an SSL 54 configuration. After lifting the reactor, the CC 8800-1 crane operator slowly slewed and walked the heavy load into position. The Demag CC 8800-1 crawler crane is scheduled to be at the Ramagundam fertiliser plant for another 40 days. The Sarens team will use it to execute five more key component erections, weighing up to 640t.